When you use the BlogLovin supplied instructions to claim your blog, you will get a BlogLovin link, with an embedded token, which you install in your blog. Paste this text into a new blog post ... In some blogs, it's necessary to put the code at the top of the blog post. BlogLovin would have you publish a new post, and put the link / token at the top of the post. This ensures that the claim link displays at the top of the page, in the blog. I'm not going to publish a new post, for joining yet one more non Blogger service. I try not to clutter the blog feed, with posts that are only needed, to host a link - particularly a link for verifying a new service connection. 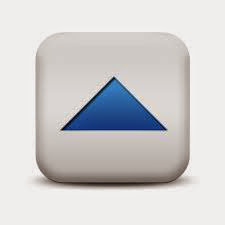 With Blogger blogs, you may be able to use a gadget, in the sidebar. The sidebar is static - so what you position in one place stays in that place. First, get the BlogLovin blog claim token, using "Claim blog". 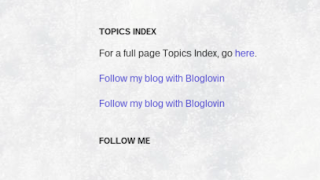 You start, by getting the BlogLovin link, and embedded token, from the "Claim blog" wizard in "Blog analytics". Either publish a new post, or position an HTML gadget properly. You will probably have to position the gadget, containing the BlogLovin link, near the top of the sidebar. Apparently BlogLovin claiming verification only reads the top of the blog content - whether posts or template objects. Get the claim link / token, from BlogLovin. Add the link / token to a post, or an HTML gadget. Publish the post, or position the HTML gadget, near the top of the sidebar. Return to BlogLovin, and click "Claim". Maybe, BlogLovin only reads content above the fold. 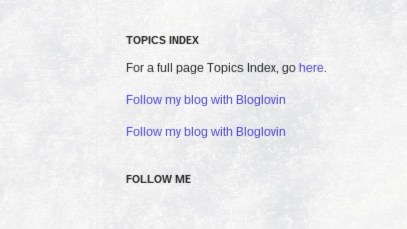 BlogLovin is allowing for blogs with activity, where new posts would push the post containing the claim link token, down the page - before the BlogLovin claim verification can find and read the claim token. Or maybe they want the new link so it's visible - and advertises their service. The uncertainty about claim link location, combined with the need for a valid feed - but criteria for valid feed being itself uncertain - will make claiming some blogs, in BlogLovin, a bit of trial and error. Then replace the claim link / token with a properly decorative button. Once your blog is claimed, you can replace the ugly claim link with a semi decorative BlogLovin button ("Get the Bloglovin button"). I was able to consolidate two BlogLovin claims, for this blog - so I removed the two ugly links, from the sidebar. My sidebar HTML gadget, with two ugly links. They are now gone. I used the "Move Followers to" option, so I can have one page for this blog. Why they had two entries, for this one blog, I don't know. Their advice here is a bit vague. This might happen when a blog have two or more different addresses to its RSS feed. All Blogger blogs, publishing a blog feed, have at least two diffeent feed addresses. Does BlogLovin only use RSS, specifically? Or are they unaware that Blogger publishes one feed, in two flavours - Atom and RSS? Anyway, BlogLovin lets you move Followers, from one blog to another - and I now have one BlogLovin page for this blog. Some #Blogger blog owners use the BlogLovin social sharing service, to provide access to their blog. The BlogLovin "Claim your blog" process uses a BlogLovin link with an embedded token, to verify blog ownership. The claiming process requires proper positioning of the claim link - plus (as previously noted) proper blog feed availability. This combination of requirements makes a BlogLovin claim somewhat unpredictable. I'm unclear why you need to claim your blog, except for as you say, to position a link to advertise their service. The feed to Bloglovin' still happens irrespective of whether the blog owner claims their blog, so it seems to me the claim is of benefit to them without any additional benefit to me. I've used the Gadget facility to advertise ways people may like to sign up for various reader services - including Bloglovin' - and that works fine.